Crepe Myrtle Pruning is often overdone. Crepe Myrtles are the lilacs of the South. Crepe Myrtles provide a summer-long display of delicate flowers. These small trees at at their best in sunny locations in hot climates. The green seedpods cluster on the tips of crepe myrtles, making their limbs sag from the added weight. Always use sharp clippers for pruning. If your trees are tall, use pole pruners. Most models come with a saw and a clipping mechanism; a rope activates a cutting blade, which is perfect for pruning hard-to-reach branches. When using pole pruners, avoid power lines. Lopping shears work well cutting intermediate-length limbs. Clip directly behind the seed clusters and new blooms will quickly appear. 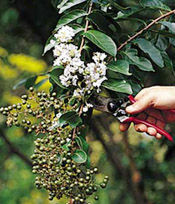 Make cuts right below the green seedpods, removing only the very tips of the branches. Usually the limbs spring back to their normal upright position once the pods are removed. Many gardeners leave these round seed capsules on the trees thinking they are flowerbuds. The seedpods are bigger than the bloom buds and are also hard and woody. The removal of seedpods not only raises sagging limbs, but it also encourages more flowers. All the energies used to produce seeds can be directed toward flower production. Trees loaded with seeds can also get too heavy during hard rains; the added weight of water may even break branches. 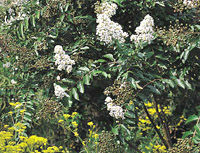 Give your crepe myrtles a lift this summer by removing the seed clusters. It makes trees look cleaner and flower more, and it will save you from dodging low limbs that droop across the landscape.